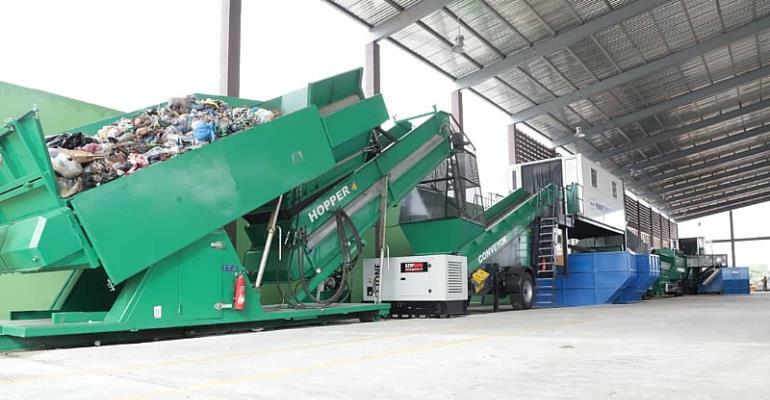 Waste management giant, Zoomlion Ghana Limited commissioned an ultra-modern integrated Recycling and Compost plant at the Accra Waste Recovery Park to help recover waste materials that will serve as resource for industries. The plant which is the first of its kind to be introduced into the country is built on a robust technology to suit Ghana’s weather condition with a capacity to process 200 metric tonnes of waste daily and nearly 100 metric tons of compost per day to displace over 864,000 bags of chemical fertilizers imported into Ghana annually. The facility will also serve as research and training centre for educational institutions where students will be allowed to use the facility for project work, internship and academic attachments as well as a center for industrial visits and tours. The Executive Chairman of Jospong Group of companies, Dr Joseph Siaw Agyepong in an address to commission the plant explained that Zoomlion since its inception in 2006 has always considered waste as a resource that should be harnessed into re-usable products hence the establishment of the Accra Compost and Recycling Plant (ACARP) which is the highest compost producing company in the country and the Kumasi Compost and Recycling Plant (KCARP) which is near completion. He said that the non-availability of landfill sites in the country coupled with its high cost of operation and a desire to realize the President’s vision of making Accra the Cleanest city in Africa pushed his company to invest in recycling plants and 16 more to be established across all the regions to tackle the huge waste problem in the country. “Mindful that the waste management system, as being operated could not match the speed with which Government was determined to see environmental cleanliness achieved, Zoomlion’s motivation to be part of the rapid waste processing solution was aroused leading us to collaborate with our European technology partners – Komptech Austria. We shared and exchanged ideas about our research findings on the concept of mobile and integrated waste technology that can be quickly installed and be capable of handling the type of mixed waste as we currently have in our communities. The outcome of this technological research partnership is confirmed by the 20 million dollar-Integrated Recycling and Compost Plant project that is about to be commissioned,” Dr Agyepong pointed out. He added that many more businesses will be located at the Accra Waste Recovery Park (AWAP) which is an industrial enclave developed by the Jospong group to provide innovative solutions for the recovery of waste materials and have them transformed into other essential products and services. The Vice President of Ghana, Dr. Mahamadu Bawumia in a speech read on his behalf by the Minister of Environment, Science and Technology, Prof. Frimpong Boateng expressed his delight for Dr. Joseph Siaw Agyepong and his company to support government’s vision of making Accra the cleanest city in the sub-region. He said the commissioning of the Integrated and Recycling Plant to produce organic compost and other materials will go a long way to support government’s drive to promote agriculture through the “Planting for Food and Jobs” and the “One District One Factory” program. He added that Government’s creation of a stable macroeconomic environment for the private sector to blossom and expand will drive the economic transformation agenda and create more jobs for the youth. Other dignitaries such as the Minister of Business Development, The Minister of works and Housing, The Deputy Minister of Sanitation and Water Resources, The Deputy Minister of Trade and Industries, The Greater Accra Minister among others took turns to address the gathering.